Dallas Office | Dallas County Employment Lawyers Rob Wiley, P.C. Contact Mesquite Discrimination Attorney Rob Wiley, P.C. If you are a prospective client, please contact us using the submit your case form that we have designed. Filling out this form ensures that your case gets the attention that it deserves. Recommended if traveling from South, East, and West Dallas, as well as from both DFW Airport and Love Field. Our office is accessible from I-35/Stemmons Freeway. You may take either the Market Center Boulevard exit or the Oak Lawn Avenue exit. If you take the Market Center Boulevard exit, head south on Market Center Boulevard. Our office is at the intersection of Turtle Creek Boulevard and Market Center Boulevard (there is a stoplight). Our office is in the white office tower with a Chase Bank sign. Free parking is available in the parking lot in front of the building. If you take the Oak Lawn Avenue exit, head south on Oak Lawn Avenue. Go right at the stoplight at Oak Lawn Avenue and Market Center Boulevard, turning right onto Market Center Boulevard. Our office is in the white office tower with a Chase Bank sign. Free parking is available in the parking lot in front of the building. Recommended if traveling from Park Cities, North Dallas, or Suburbs North of Dallas. 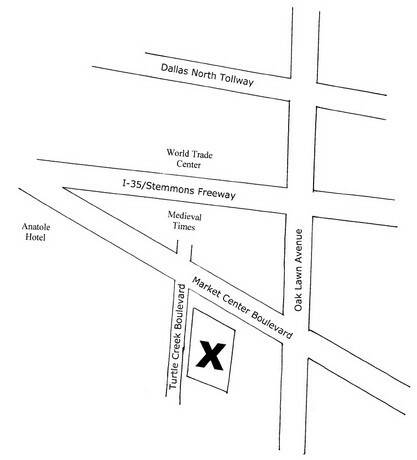 Our office is accessible from the Dallas North Tollway. Exit the Tollway at the Oak Lawn Avenue exit. Take Oak Lawn Avenue south. You will drive under I-35 and into the Dallas Design District. Go right at the stoplight at Oak Lawn Avenue and Market Center Boulevard, turning right onto Market Center Boulevard. Our office is in the white office tower with a Chase Bank sign. Free parking is available in the parking lot in front of the building. The 405 Bus stops at Wycliff @ Irving. It is a ten minute walk from this station to our office. Take Irving Boulevard toward downtown. At the stoplight at Turtle Creek Boulevard, turn left onto Turtle Creek Boulevard. As you go up Turtle Creek Boulevard, our office is on the right hand side. It is the white office tower with a Chase Bank logo.